FIRE HATT is a 43′ Hatteras Convertible, the newest and freshest fishing charter boat in the Kona Charter Fleet. For anyone who knows boats, Hatteras stands out as the worlds very best brand of boat, as many consider it the finest boat made. It has a hull designed to slice through any water smoothly and provide for the ultimate stable fishing platform. It combines engineering, power, “fish ability”, and stability with an interior that is elegant and comfortable. Every detail from wiring looms on down to the grade of stainless steel used in bolts and fasteners is exceptional. FIRE HATT is world class in manufacturing, cleanliness and safety. You will think you are on a brand new boat. Fishing Gear includes a full complement of SHIMANO Reels from light tackle up to Tiagra 2-speed 130TI reels and Tallus Rods. A complete “Tackle Store” of proven lures including the Marlin Magazine featured “10 Best Lures of all Time” put together by Melton Tackle International. From inshore bottom fishing for the kids to the offshore “Pursuit of the Grander”, we troll lures, live baits, drift and deploy downrigger fishing. 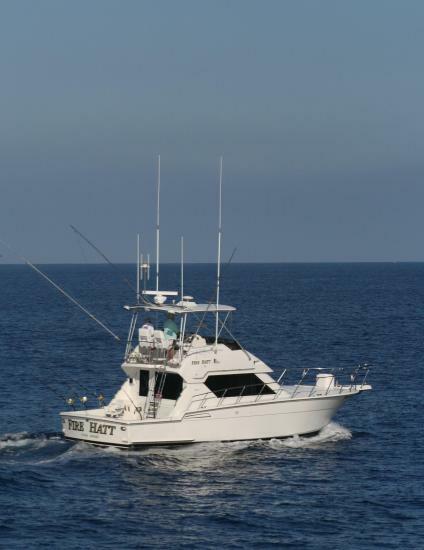 Also featured are a Release Marine Fighting Chair, Rupp Outriggers, live bait well and built-in tackle center. We specialize in Swordfishing for those who want to pursue the “Gladiator of the Deep”. Amenities include a Smoke Free Environment and an Air Conditioned Salon. You won’t believe you are on a “Fishing Machine” as the interior is absolutely clean, comfortable and elegant. There is a full Galley and food prep/storage area, separate ice maker, large modern head and shower. FIRE HATT was a feature boat on ESPN, and the OLN Television Show “Ultimate Shark Hunters” and again the following year on the VERSUS Network in “Shark Hunters, East Vs West” Series. Last minute Walk-Up Charters welcome. Children always welcome. Affordable full day, three quarter day and half day charters. Catch Marlin, Wahoo, Ono and Mahi. Winner of the 2002 Southern California, IGT Zane Grey Marlin Tournament held in the fabled waters off Catalina Island.